impress. We’ve got your recipes covered and your decorating tips too! but, the results are not! Ideas, almost too good to eat! These adorable pictures are from the collection of Martha Stewart baby shower ideas. Check out this fast and easy way to decorate; free cupcake toppers on us! Make or purchase cupcakes in plain baking liners. 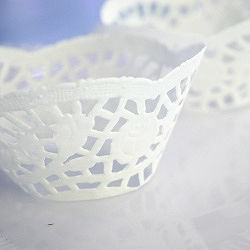 Purchase 1 dozen, round, paper-lace doilies. Wrap the lace edging around each cupcake, cut off any excess and secure with clear tape. 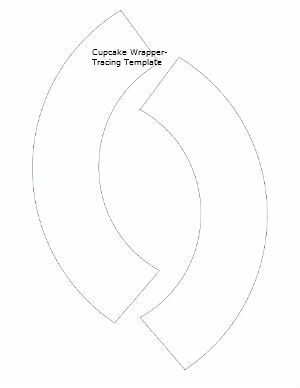 Cut, wrap, and tape-EASY, CUTE, cupcake wrappers! a cute design to go with your party. flour mixture in two parts, alternating with 1 cup milk. add cocoa mixture, scraping down side of bowl as necessary. Gradually beat in 4 tablespoons milk and 1 teaspoon vanilla. Beat frosting until light and fluffy, about 45 seconds. it’s delicious with raspberry fruit filling. of fillings to your guests; or you can stick with just one. wrappers or both. Add a cupcake topper for a finishing touch! TIP: If you decide to bake your cupcakes from a box…no one will ever know! •In a medium mixing bowl, stir together flour, cocoa, and salt. mixture, beginning and ending with the dry ingredients. 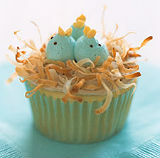 This recipe yields: 24 baby shower cupcakes.